(June 1, 2002) Triple Aught Design Gear's "Life Capsule Alpha" ($40 +S&H) is a robust cylindrical container for a personal survival kit designed to be worn around the neck, though you could carry it in a pocket just as well. Machined out of 7075-T6 aluminum and clear anodized, this appears like it would stand up to just about anything. Driving our full-size 3/4-ton 4WD pickup truck over the capsule a few times didn't faze it a bit. 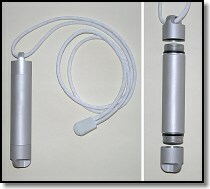 The capsule is 4 1/8 inches (105 mm) long with a 3/4 inch (19 mm) O.D. The interior is 9/16 inch (14 mm) I.D. There are two compartments with end caps that screw on and seal with a single o-ring. The caps proved waterproof to three feet, we didn't test the capsule any deeper. The primary compartment is 2 23/32 inches (69 mm) deep at the center, 2 19/32 inches (66 mm) deep at the sidewall; the secondary compartment is 7/32 inch (5.5 mm) deep with a flat bottom. The caps provide an additional 1/16 inch (1.6 mm) head clearance when screwed down. Weight is 1.4 oz. (40 g). We found the 36 inch lanyard way too long for our comfort, hanging down on the bottom of the breastbone. We think it would be better if TADG just provided the plastic snap-together end tab for the lanyard and let the consumer adjust the length to suit. We're not sure what the photoluminescent cord really adds, I think we'd prefer real paracord with it's multi-functional capabilties. The small compartment is designed to accept the 15 mm Pyser-SGI FB-1605 brass NATO compass; we found a Brunton 15mm plastic compass also fit nicely. The brass compass does rattle a tiny bit unless you take measures to prevent it. The capsule comes with what might be the start of a personal mini-kit: five small strike-anywhere matches (no wet-proof coating), a small birthday style candle and a some fishing gear (monofilament, two hooks, two sinkers). The main compartment has plenty of room for a Spark-Lite, tinder and other necessities. The overall impression of quality is high, which it ought to be for forty bucks. It should certainly survive anything your body will. It's large enough to accommodate the basic gear you should always have with you and if it's around your neck there very good chance it won't be lost. If this Life Capsule Alpha sounds too rich for you, TADG are promising a more affordable "Beta" version made of an easier to machine aluminum alloy that still ought to be plenty tough for most. 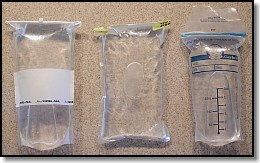 (June 2, 2002) Condom Alternatives for PSKs: While condoms are often included in personal mini-survival kits to serve as water containers, we don't think anyone would suggest they don't leave a lot of room for improvement. The two biggest drawbacks have always been that they are difficult to fill in many circumstances and closure is problematic. We looked at some alternatives that might prove better choices for some. All are similar in some respects, they are a plastic bag with a closure seal at the top. Unlike a condom that stretches, this does limit the amount of water they can hold. On the other hand, all four we tested fit nicely in a cargo or jacket pocket when filled. All are pre-sterilized, which is a nice feature. Some other alternatives we've seen pressed into service are not. The first bag we stumbled upon in the department store while traversing the baby care aisle on our way elsewhere. Mothers expressing breast milk need a way to store it and these storage solutions caught our eye. The Gerber Products "Seal 'n Go Breast Milk Storage Bags" is gusseted at the bottom to allow it to stand up (but it failed to do so in our tests). We were able to fill it with 10 fl. oz. (300 ml). The closure is a triple zipper lock seal that closed very easily and very well. Even when turned upside down and shaken, it held. This is not your typical Zip-Lock bag. We put it in a pocket and carried it for days without it leaking a drop. Put enough pressure on it and it will pop open, of course, but we were impressed by how well it held, even when dropped from a height of four feet. We were unable to determine a thickness for the material, but we would guess it to be about 1.8 to 2.0 mil. The other bags we tried are "Whirl-Pak" sample bags from Nasco. We experimented with three different bags that are listed as holding 18 oz. (540 ml). We tried the 2.5 mil B01065WA (same as B000746WA but with a white write-on strip) and the 4.0 mil BO1065WA, both flat bags, and the 3.0 mil BO1365WA that is gusseted (and has a write-on strip) and that does stand up when filled. In our experiments we were able to fill the gusseted bag with just 15.2 fl. oz. (450 ml) and still have a reliable seal. The flat bags we were only able to fill with about 11.8 fl. oz. (350 ml) and still get a reliable seal. You could fill them with more, but the seal would sometimes leak a bit. The Whirl-Paks come in larger sizes, we selected these because they seemed like a good compromise to fit inside the small kits as far as their width goes. The zipper lock seal of the Gerber was easier to use than the Whirl-Pak and will reseal as often as needed. To seal the Whirl pack bags, you pull on both ends of the wire at each side and then twirl the bag around three revolutions. If you didn't get a tight roll, you'll need to try again. Folding the tabs that stick out onto the face opposite the fold holds the rolled up top portion together. We refilled and sealed the Whirl-Pak bags dozens of times without failure. Like the Gerber, we carried them around in a pocket, dropped and abused them they stood up to it with no problems. NOTE: Reader Tad Smith reports the following from his military experience with the Whirl-Pak bags: The big disadvantage is that stored for extended period in high heat or humidity, the adhesive that holds the paper to the wire can get gooey and fail. Also, when repeatedly dipped in water to fill the paper can fail. While everything still works, the wire is a bit harder to close and the bag is a bit harder to twirl. Some older ones, like 10 years old (what can I say I am a pack rat that keeps testing stuff) may have the wire actually come unattached from the bag. Be especially careful about packing the bags with anything that is pushing on the bag with a point or edge. The bag can get a weak spot and fail at the constant pressure point when opened and filled. The Gerber bags are 3 7/8 inches (98 mm) wide, the Whirl-Pak bags are 4 1/2 inches (114 mm) wide. There is no air trapped inside when new and all can be rolled into a tight flattened cylinder that compares nicely in volume to a typical condom package, about 3/8 inch (9.5 mm) wide by 1/4-5/16 inch (6-8 mm). The Gerber fit in an Altoids tin diagonally and across the width, the Whirl-Pak fit diagonally into a standard size tobacco tin with room to spare. We prefer the zipper lock seal for ease of use, but the added capacity of the gusseted Whirl-Pak is a definite advantage. Any of these would make probably make a good alternative to a condom for survival kit use. © 2002 Douglas S. Ritter & Equipped To Survive Foundation, Inc.